- in the south, an arid area, with slightly cold winters and hot summers. Here we find also a practically flat area: in the Ebro Valley, the altitude drops below 300 meters (1,000 feet). The rains are abundant in the north, where they exceed 1,500 millimeters (60 inches) per year, and in some cases as many as 2,000 mm (80 in), while they become progressively scarcer as you head south. Pamplona is located in the intermediate band, where precipitation ranges from 700 to 1,000 mm (27 to 40 in) per year. In the south, precipitation drops below 600 mm (23.5 in), and in the southernmost part, which is definitely arid (see Tudela), even below 400 mm (16 in). Let's start from the north, the area affected by the Atlantic Ocean. In the valleys located at low altitude, around sea level, winter is mild and summer is pleasantly warm. Here, for example, are the average temperatures of Lesaka. In Lesaka, the rains are plentiful, since they reach 1.750 mm (69 in), and are frequent throughout the year. Summer is the least rainy season. Here is the average precipitation in Lesaka. At higher altitudes, both in the Cantabrian area and in the Pyrenees, the temperature decreases. The highest point of Navarra is Mesa de los Tres Reyes, 2,428 meters (7,966 feet) high, on the border with France. For example, here are the average temperatures of Abaurregaina/Abaurrea Alta, situated at 1,050 meters (3,450 ft), in the northeast, in the Pyrenean area. We now come to the central belt. 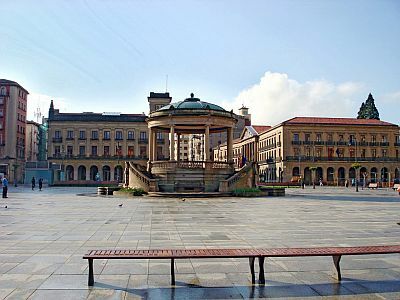 In the capital, Pamplona, winter is cold enough: the average temperature in January is 5 °C (41 °F). There are mild periods, with daytime temperatures hovering around 12/15 °C (54/59 °F), however, the city is exposed to cold air outbreaks from Eastern Europe, which can bring snowfalls and frosts: there are on average 10 days with snowfall per year. In January 1985, the temperature dropped to -15 °C (5 °F). Summer is warm enough, the average of August being 21.5 °C (70.5 °F), generally with cool nights, but the temperature undergoes considerable variations, both between night and day and from one day to another: waves of intense heat are possible, when the temperature can exceed 35 °C (95 °F), and sometimes can reach as high as 40 °C (104 °F), but also pleasant and spring-like days, with highs around 20 °C (68 °F), when nights can be very cool, below 10 °C (50 °F), especially in June. In Pamplona, 700 mm (27.5 in) of rain (or snow) fall per year. The wettest seasons are spring and autumn; summer is the least rainy season, but it is not so dry, since occasionally some rains or thunderstorms can occur. We come now to the south. 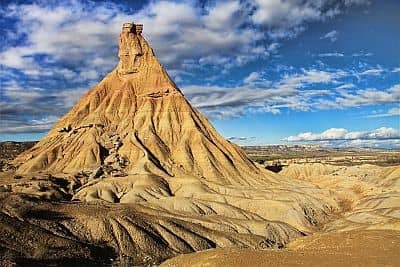 Here, the summer is hot, and the rains are much more scarce, so much so that there is also a semi-desert area, with a lunar landscape, called Bardenas Reales. Here are the average temperatures of Tudela, located in the Ebro Valley. In summer, hot days, with highs around or above 35 °C (95 °F), are quite frequent. In Tudela, precipitation amounts to only 380 mm (15 in) per year; on average it does not reach 50 mm (2 in) in any month, and winter is particularly dry, while in summer some thunderstorms can occasionally break out. The amount of sunshine in Navarre is not very good in the north, where cloudy days are frequent throughout the year (although in summer there are 7/8 hours of sunshine per day); in Pamplona, it's good in summer (in fact, there are 10 hours of sunshine per day in July), and even more in the south, where sunny days are frequent throughout the year, but especially in summer. Here are the average daily sunshine hours in Pamplona. 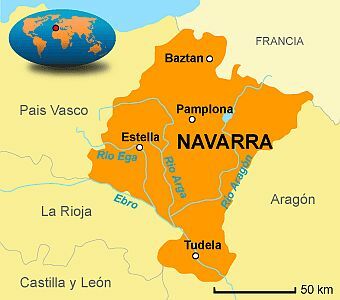 The best time to visit Navarre, at least in the north, is the summer, from June to August or the first half of September, since it is the driest and sunniest time of the year. July and August are the warmest and least rainy months. You must take into account some rain in midsummer as well, and some nights a little cool in the valleys, and a little cold in hill areas. In Pamplona, in July and August you can find warm weather during the day, with cool nights, but there are also hot days, so you may prefer June and September. In the south, which in summer can be hot, you can go in spring and autumn, especially in May, and from mid-September to mid-October, even though it rains more often.